Jackie Bolduan, a second-year graduate student, and more than 20 graduate students held a sit-in Thursday in Rice Hall alongside undergraduate students supporting their unionization effort – a move that ultimately led to a meeting with Provost Forrest Maltzman. When three graduate students entered a meeting with Provost Forrest Maltzman Thursday, they expected to negotiate with the provost and convince him to recognize them as employees with the right to unionize. But they walked out of Rice Hall disheartened, with the same list of demands they have had since the beginning of the academic year. Graduate students said Maltzman reiterated the University’s viewpoint that their work experience is educational, not professional – meaning the students don’t have the standing to form a union. The students said officials told them they could bring their case to the National Labor Relations Board to settle the dispute – but the board has historically struck down student labor unions under Republican administrations. Labor relations experts and members of graduate student unions at private institutions said if graduate students continue to garner support from faculty and undergraduates, they may be able to push the University to acknowledge them as student workers without going through the NLRB. Graduate student leaders said officials want graduate students to file a petition with the NLRB because they know it will lead to a dead end – but the students said they will escalate protests and demonstration efforts if the University continues to dismiss them. Graduate students said while the meeting began a conversation with officials, unionization is a far-sighted goal because the University still will not recognize the group as a collective bargaining unit. “I look forward to continuing to make strides together with students, faculty and school administrators to enhance the graduate student experience,” he said in an email. University spokeswoman Lindsay Hamilton said graduate students requested that the University recognize them as a collective bargaining unit without obtaining an election through the NLRB. She said if graduate students filed a petition with the NLRB to unionize, the University would participate in the process. “The University will continue to work with our graduate students to obtain feedback on ways to improve their educational experience,” Hamilton said in an email. The University made the same argument when resident advisers filed a petition with the NLRB last academic year to establish a union – but the board ruled in favor of the RAs, saying they were University employees and had the right to organize. But graduate students reasserted their opposition to bringing the case to the NLRB, saying it’s unlikely their bid would be approved under a Republican administration, which has historically rejected student worker unions. Experts said that if the case was brought before the NLRB and board members decided not to recognize the union, the decision would overturn a 2016 precedent allowing graduate student workers to collectively bargain, which could force already-established unions at institutions like Columbia and Georgetown universities to dissolve. Michael Horka, a fifth-year doctoral student, said officials are not giving in to graduate students’ demands because the University would profit less from their work as teaching and research assistants if they were to offer higher pay and health care. The effort to unionize began in September when graduate students sent a letter to Maltzman and University President Thomas LeBlanc asking to collectively bargain for a higher pay grade and better health care, which Maltzman rejected. Graduate students delivered a box of about 160 letters from graduate and undergraduate students to LeBlanc earlier this month demanding better health care benefits and pay. 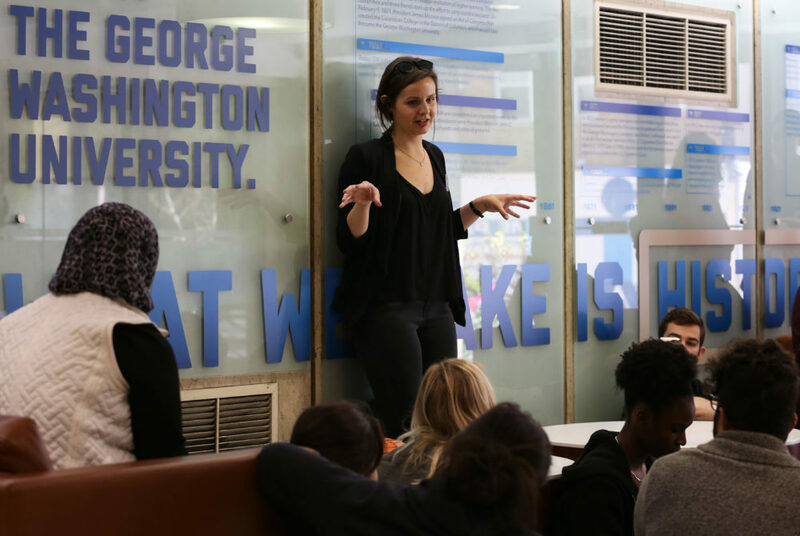 The students said they also protested throughout the month at Inside GW days, where admitted students visit the University. Graduate students held a sit-in Thursday in Rice Hall alongside undergraduate students supporting their effort – a move that ultimately led to the meeting with Maltzman. Bolduan, a second-year graduate student, said the meeting’s result was disappointing because officials still rejected their request. “Even with all that longevity and momentum, they still did not want to do the right thing,” she said in an interview after the meeting. After the failed meeting, graduate students said they would return to Rice Hall and continue protesting until Maltzman agreed to a third-party election to determine if they should unionize. But a GW Police Department presence blocked them from entering Rice Hall Friday, leading them to demonstrate for more than five hours outside the admissions office in the Marvin Center instead, graduate students said. Graduate students at GW joined a nationwide effort to unionize at private institutions, like Tufts and Johns Hopkins universities, but experts and members of graduate student unions at private institutions said officials typically stand by their opposition to unions unless students continue to stand together and push for a union. Kevin Carriere, a graduate student at Georgetown University, which was granted a third-party election last month, said officials gave in after students turned out in droves to demonstrations and graduate students gained more support from undergraduate students and faculty. He said without protests, Georgetown officials would have never given in to their demands. “It was the perfect storm of us coming together after that initial rejection and having a large showing of our collective voice together that we weren’t going to go away,” he said. Gordon Lafer, a professor of policy research at the University of Oregon, said the University will likely wait out graduate students’ demonstrations and protests in the hopes that students will bring their case to the NLRB and fail under a Republican board. “GW administrators will essentially be siding with the Trump administration, hoping the White House appointees overturn current law and rule,” he said. Parth Kotak and Liz Konneker contributed reporting.